Photo 1260 - "MAMMA The Mother of all search engines"
Imagem capturada da Internet do Site www.mamma.com. Este Site de uma máquina de busca usava até há pouco tempo atrás a imagem do Fusca como ícone de seu índice: "mamma/shops" que hoje se chama mamma/favorites. A versão do ídice com o pequeno Fusca pode ser vista abaixo. Image captured from the Internet Site www.mamma.com. This Site is a search engine and used a VW Beetle as icon of their index until short time ago , formerly "mamma/shops", now "mamma/favorites". The former index version with the little VW Beetle icon can be seen below. Esta imagem também já fazia parte do Site, o assunto agora está duplicado com a abertura desta nova categoria de pesquisa. Esta imagem mostra a versão de 14ABR2000 do index "mamma/shop" com o pequenino ícone de Fusca, clique para ampliar. This image was already part of the QUEST's Site, the subject is now duplicated with the opening of this new category of the survey. 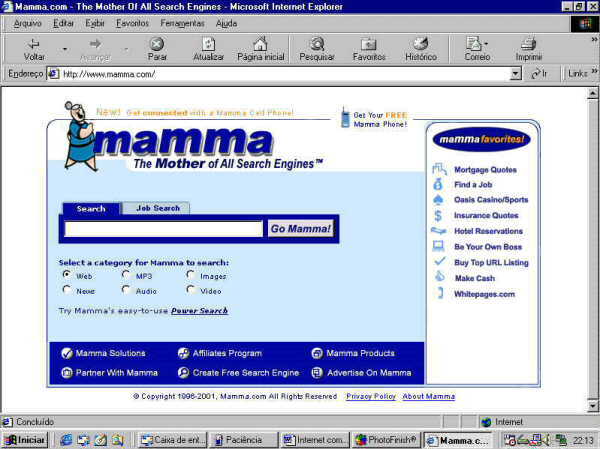 This image shows the 14ABR2000s version of the "mamma/shop" index with the little VW Beetle icon.